Author, illustrator and Neuroscientist Dr Matteo Farinella, is back with another brilliant publication following the success of his previous book about the brain, Neurocomic. In The Senses, Farinella combines science with history to produce a phenomenal piece of work that educates, stimulates and entertains using exquisitely detailed black and white illustrations in graphic art, as the companion to his text. Each of the five senses is introduced individually through an interesting approach to teaching and learning. The complex becomes simple, when the scientists that pioneered various aspects of each sense, are introduced. They take us with Diane, a traveller through the senses via her augmented virtual reality device, on a journey of information, exploration and explanation of our senses, how they work, and why. For those with enquiring minds interested in this field of science, that have questioned why things taste the way they do; why animals can see and hear things humans can’t, and why the nose speaks the language of memory and emotions, this book will intrigue and absorb you. There is an outstanding list of Notes on many of the scientists whose contributions to science were used. The Recommended Reading will send science fans straight to research areas and libraries to seek out the listed books whose poetic titles sound like music. 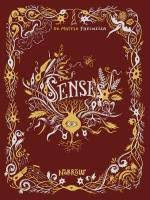 The Senses will make a valuable addition to any personal bookshelf and school or community library.